The Mic-E compressed position report message provides a status code for each reporting station, indicating its current status. APRS 1.2 includes a new format for text position report messages to also indicate the standard Mic-E station status codes. This filter allows selecting only stations with selected Mic-E status values. 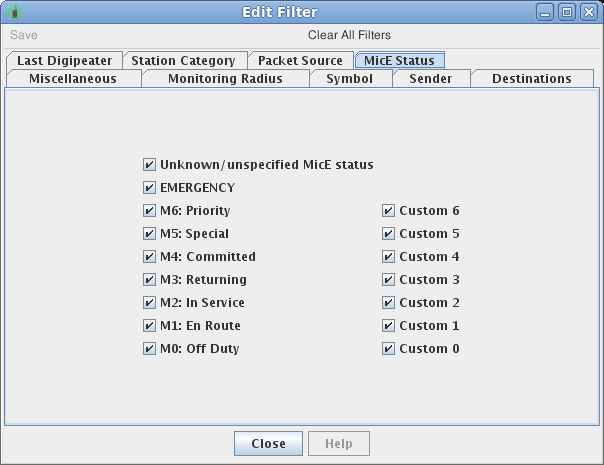 By default, the filter accepts stations with all Mic-E status codes (standard and custom) and also stations with no Mic-E status reported (because they have not yet sent a position report message, or because they are actually objects/items).